The summer school Producing Girlish Knowledge took place in Helsinki from 23 to 26 August, 2016. 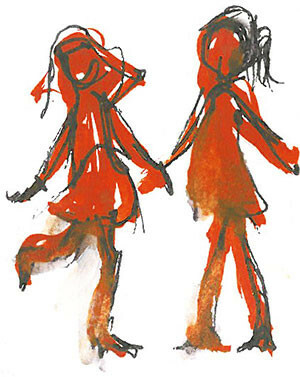 The program created a unique forum for academic experts, students, and social workers to meet and discuss their knowledge in girlhood research and girl work, as well as sharing their concerns, hopes, and desires for the future of girlhood studies. Throughout the summer school, the focus on methodology remained central to the keynote lectures and workshops. The first keynote was given by a feminist scholar and artist from University of Tampere, Saara Särmä, who introduced the concept junk feminism and the use of visual collaging as a mode of presenting research that disrupts the traditional seriousness of academia. Saara engaged the summer school participants in her research on meme cultures, revealing how things seen as everyday trivialness can be a source to produce and reproduce dominant cultures and international relations. Saara encouraged her audience to rely on humor, imagination, and creativity to raise feminist arguments and criticism. In the second keynote, Professor Elina Oinas from University of Helsinki emphasized the use of reflexivity and the acknowledgment of positionality in girlhood research. Elina gave a small exercise for the summer school participants to reflect on their research experiences, and addressed the ownership of knowledge as an ethical issue. This workshop raised crucial discussions on the transparency of the research process and methods to embody the research. An emphasis of the discussion was that one should not make assumptions on any positionality or ready categories when doing research, and should develop certain sensitivity to dismantle the traditional subject-object relationship and listen to the silence within the data. The second day of the summer school was developed around the theme collaboration. It began with the discussion of Bodil Formark, Linda Forsell, and Kajsa Widegren on the transformation of research material into artistic performances. The speakers emphasized the idea of a space for collaboration in research, a space that allows for sharp questions, curiosity, reflections, and recognition of efforts. Through this space knowledge becomes aesthetics, and aesthetics becomes knowledge. The role of music in constructing the collaboration space was also highlighted: Squeeze wax by Cocteau Twins was featured at the end of the discussion, echoing a dream-like feeling of lost and found, of freedom and wandering, of femininity expressions and imaginations. The theme collaboration was later extended in the girl-work-method workshop held by girl workers, Liinu Diaz Rämö, Arbresha Rexhepi, and Ann-Charlotte Roswall from Sweden, and Sonja Puolakka and Nelli Niemelä from Finland. These social workers stressed the need for cross-broader and inter-disciplinary collaboration between activist organizations and researchers, where research findings are made available and accessible for the social workers who work directly with girls. This collaboration would also benefit researchers as these organizations could provide academic experts with potential study topics and a direct connection with the girl-subjects. During the workshop, a question was given to the researchers (“If knowledge is power, whose knowledge are we increasing?”), emphasizing the need to bridge the gap between research work and social work, between academia and activism. The last keynote of the program was given by Professor Ulrika Dahl from Södertörn University. Ulrika gave a rich reflection of her fieldwork experiences where she explored queer femininities from femmes in different parts of the world. She emphasized an ethnographic attitude toward research, which required researchers to not limit themselves into any discipline, remain mindful throughout the process, and dare to take risks. Ulrika also gave several examples of her ethnographic work in her presentations, through which she demonstrated her method of doing research with (rather than on) the subjects. Dialogues, reflections, and participation into the field allowed her to yield rich, remarkable data on queer femme women and their own interpretations of femmes – untold stories that existed beyond the mainstream, hegemonic representation of beauty, femininity, and queerness. Aside from the profound keynote lectures, the summer school also had several parallel workshops where participants gave individual presentations. I was particularly impressed by two presentations. The first one was given by Susanna Rönn (University of Vaasa) on “Contemporary Riot Grrrl Visual Culture and the Girl Gaze”. Through her analysis of the music video White Flag by Slutever, Susanna demonstrated the use of the “girl gaze” as active productions of empowered girlishness that challenge hegemonic representation of girlhood and the gender binary. Her presentation was a remarkable example of how visual culture could become a channel to situate and reproduce feminist knowledge and perspectives. The second presentation, from Karoliina Sjö (University of Turku), illustrated how research data can be embodied into artistic performance. Karoliina gave a powerful, emotional reading of a poem she constructed from her research material, which was the diary writing of Kirsti Teräsvuori. Through her poem reading, the thoughts and feelings of Kirsti Teräsvuori came to life, which evoked a lot of emotions from the audiences. In the final discussion, the summer school participants reflected on what they had learned throughout the program, and talked about the dream for a utopia – a meeting place for researchers, girl workers, and artists. Utopia is the possibility to challenge, bend, and break the rigorous rules of academia that bind research within the walls of traditional standards. Utopia is the transforming of conventional research methods into new, creative, daring ways of embodying, living, and performing knowledges. Utopia is a safe place to share, collaborate, connect, and establish networks of support, creativity, dialogues, and friendships between academic experts, social workers, and performers. The official program concluded with a bottle of champagne as a gift from the Swedish researchers to the Finnish organizers, a symbol of friendship, recognition, and international collaboration.